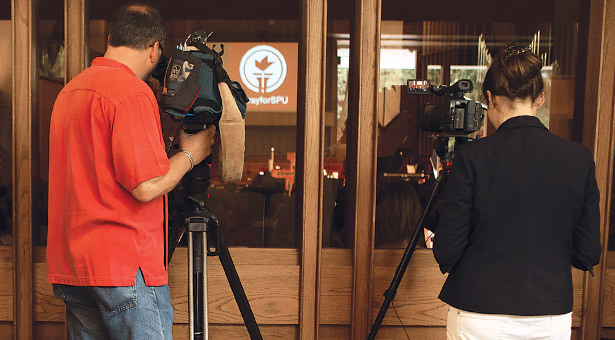 News cameras were present in the foyer of First Free Methodist Church during an SPU community prayer service. On Thursday, June 5, around 3:30 p.m., a shooting took the life of one of our students and injured two others. By 7 p.m. on that day, the mayhem had mostly subsided, and the Seattle Pacific University campus community did something that has seldom been seen in the aftermath of the many school shootings that have occurred in recent years. And it was the praying, almost as much as the shooting, which seemed to capture the attention of the media in the next couple days. As a Christian academic community, it seemed to be the most natural and needful thing for us to do at that moment to gather in the campus church for corporate worship, and then to gather in small groups for prayer and lamentation till nightfall. Several other services, including a memorial for the deceased student, Paul Lee, were held in coming days. We were all grief-stricken, but as Christians we are required to bear up with hope. We were shocked and angry, but we are forbidden to be vengeful. We were broken, but we know that it is only by recognizing our own brokenness that we are able to extend mercy and compassion to others when their brokenness is unleashed upon ourselves. So we did what Christians do in the face of senseless evil: We looked to the Source of Goodness. We lamented the fallen and wounded. We gave thanks for the heroes and safety officers and medics. We interceded for the bereaved … and for the gunman. As we prayed, two things happened: God heard our prayers, and the media watched us praying. The first of these was a mercy; the second was a fresh trial. That God heard our prayers came as no surprise. For slowly … very slowly … we began to heal. Our anger remained — and had to remain, lest the evil we had experienced be trivialized. But nobody was heard to demand vengeance against the killer. Our grief persisted, and even grew in its intensity. But so did our resolution to trust the One whose ways we don’t understand. Our brokenness was more obvious to us than ever. But expressions of concern and support poured in from families and friends, from loyal alumni and perfect strangers, from sister schools and local churches, from neighbors across the street and neighbors across the world. Banners with words of encouragement sprouted all over campus. Floral bouquets ringed the crime scene. The fact that the TV cameras were recording all this was another story. We Christians are forbidden to “practice [our] piety before others in order to be seen by them” (Matthew 6:1), but we are also required to “speak [God’s] word with all boldness” (Acts 4:29). We are told “to be ready to make [our] defense to anyone who demands from [us] an accounting for the hope that is in [us]” — but to do so “with gentleness and reverence,” abstaining from self-display (1 Peter 3:15). On that awful evening, when we needed to huddle together in order to begin healing, we found ourselves the object of media attention. We are required to bear public witness to our faith — but this hardly felt like the proper occasion or setting for that. It was very awkward. We had to pray in a way that was emotionally real, lest we prove ourselves hypocrites before God. But we had to avoid turning our agonized devotions into the grotesque unreality of reality TV by displaying either exaggerated emotionalism or mock-heroic stoicism for theatrical effect. We had to act as if we weren’t being watched, but we also had to act as if we weren’t trying to act as if we weren’t being watched. When I was a boy, I once complained to my parents that my sister had kept her eyes open during table grace. To which Mother smilingly responded, “And how do you know that?” I learned that day that when it comes to religion, showing too much curiosity about the devotional practices of others is as dangerous as taking too much pleasure in having others observe one’s own. I hope that the SPU community avoided the latter during that week, and that the watching world avoided the former. I hope that God’s healing grace could be seen in our campus tragedy — either because of us, or in spite of us, or perhaps both.